Definition at line 378 of file dbghelp_private.h. Definition at line 400 of file dbghelp_private.h. Referenced by cmp_sorttab_addr(), module_new(), module_remove(), module_reset_debug_info(), resort_symbols(), symt_add_module_ht(), symt_find_nearest(), and symt_grow_sorttab(). Definition at line 389 of file dbghelp_private.h. Referenced by dwarf2_parse_compilation_unit(), eval_expression(), module_new(), module_remove(), pe_load_coff_symbol_table(), pe_load_dwarf(), pe_load_export_debug_info(), pe_load_msc_debug_info(), pe_load_native_module(), pe_load_rsym(), pe_load_stabs(), pe_locate_with_coff_symbol_table(), pe_map_directory(), and symt_get_info(). Definition at line 401 of file dbghelp_private.h. Referenced by module_new(), module_remove(), module_reset_debug_info(), pe_locate_with_coff_symbol_table(), SymLoadModuleExW(), and symt_add_module_ht(). Definition at line 407 of file dbghelp_private.h. Referenced by module_new(), module_remove(), module_reset_debug_info(), symt_find_type_by_name(), symt_new_basic(), symt_new_typedef(), and symt_new_udt(). Definition at line 385 of file dbghelp_private.h. Definition at line 381 of file dbghelp_private.h. Referenced by add_module_typeinfo(), af_loader_compute_darkening(), dwarf2_parse(), dwarf2_parse_compilation_unit(), dwarf2_set_line_number(), map_pdb_file(), module_find_by_addr(), module_find_by_nameW(), module_get_containee(), module_get_container(), module_is_already_loaded(), module_is_container_loaded(), module_new(), module_remove(), module_set_module(), pe_load_coff_symbol_table(), pe_load_dbg_file(), pe_load_dwarf(), pe_load_export_debug_info(), pe_load_msc_debug_info(), pe_load_native_module(), pe_load_rsym(), pe_load_stabs(), pe_locate_with_coff_symbol_table(), resort_symbols(), rsym_parse(), stabs_parse(), SymEnumerateModulesW64(), SymGetModuleBase64(), SymGetModuleInfoW64(), SymLoadModuleExW(), symt_add_func_local(), symt_new_compiland(), symt_new_constant(), symt_new_function(), symt_new_global_variable(), symt_new_label(), symt_new_public(), symt_new_thunk(), symt_new_udt(), type_module_define(), and x86_64_find_runtime_function(). Definition at line 382 of file dbghelp_private.h. Referenced by module_set_module(), and SymEnumerateModulesW64(). Definition at line 383 of file dbghelp_private.h. Referenced by module_find_by_addr(), module_find_by_nameW(), module_get_containee(), module_get_container(), module_is_already_loaded(), module_is_container_loaded(), module_new(), module_remove(), SymEnumerateModulesW64(), and SymFromName(). Definition at line 397 of file dbghelp_private.h. Referenced by module_new(), module_reset_debug_info(), resort_symbols(), and symt_find_nearest(). Definition at line 398 of file dbghelp_private.h. Referenced by module_new(), module_reset_debug_info(), resort_symbols(), and symt_add_module_ht(). Definition at line 392 of file dbghelp_private.h. Referenced by module_new(), module_remove(), source_new(), symt_add_enum_element(), symt_add_func_line(), symt_add_func_local(), symt_add_function_point(), symt_add_function_signature_parameter(), symt_add_type(), symt_add_udt_element(), symt_new_array(), symt_new_basic(), symt_new_compiland(), symt_new_constant(), symt_new_enum(), symt_new_function(), symt_new_function_signature(), symt_new_global_variable(), symt_new_label(), symt_new_pointer(), symt_new_public(), symt_new_thunk(), symt_new_typedef(), symt_new_udt(), symt_open_func_block(), and symt_ptr2index(). Definition at line 380 of file dbghelp_private.h. Referenced by module_new(), and symt_get_info(). Definition at line 386 of file dbghelp_private.h. Referenced by module_new(), and pe_load_native_module(). Definition at line 396 of file dbghelp_private.h. Referenced by module_new(), module_reset_debug_info(), resort_symbols(), symt_add_module_ht(), and symt_find_nearest(). Definition at line 399 of file dbghelp_private.h. Referenced by module_new(), module_reset_debug_info(), and symt_grow_sorttab(). Definition at line 413 of file dbghelp_private.h. Referenced by module_new(), module_remove(), module_reset_debug_info(), source_get(), and source_new(). Definition at line 412 of file dbghelp_private.h. Referenced by module_new(), module_reset_debug_info(), and source_new(). Definition at line 414 of file dbghelp_private.h. Referenced by module_new(), and source_new(). Definition at line 411 of file dbghelp_private.h. Definition at line 384 of file dbghelp_private.h. 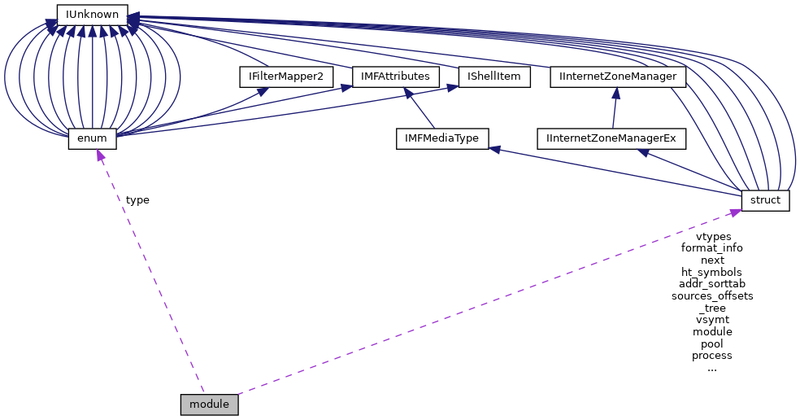 Referenced by module_find_by_addr(), module_is_container_loaded(), module_new(), pe_map_directory(), pending_flush(), stabs_parse(), SymEnumerateModulesW64(), and SymFromName(). Definition at line 395 of file dbghelp_private.h. Referenced by module_new(), symt_index2ptr(), and symt_ptr2index(). Definition at line 408 of file dbghelp_private.h. Referenced by module_new(), module_reset_debug_info(), and symt_add_type().